The 410 Taylor Guitar isn’t much different from the 310 — except for something called ovangkol. It makes a subtle but important difference. If you haven’t jumped on the ovangkol bandwagon yet — or even heard of this wood that is sometimes mistakenly called African rosewood — you may need some education to warm up to it. It produces a warmer sound than sapele or mahogany when it’s used for a guitar’s body. In the case of the Taylor 410ce, an ovangkol back and sides are topped with Sitka spruce — Taylor’s go-to wood — for a warm and rich sound that most players consider a step up from the 300 series models. Ovangkol has something else going for it: Its unusual and attractive grain makes for guitars that look as upgraded as they sound. With a tone that Taylor says is similar to Indian rosewood, ovangkol has a color that’s yellow-brown to olive-brown to even dark brown and it has stripes that are gray and sometimes almost black. When the coloration takes on a more purple hue, the wood starts to look like East Indian rosewood. And it sounds like it, too, although it may be brighter and more resemble mahogany or koa in sound sometimes. Like all of the 400 series instruments, the 410ce has a single Venetian cutaway and is outlined with dramatically contrasting white binding. Of course, it also features Taylor’s Expression System pickup, the company’s proprietary, fully-integrated way of transferring sound into an amplification system. 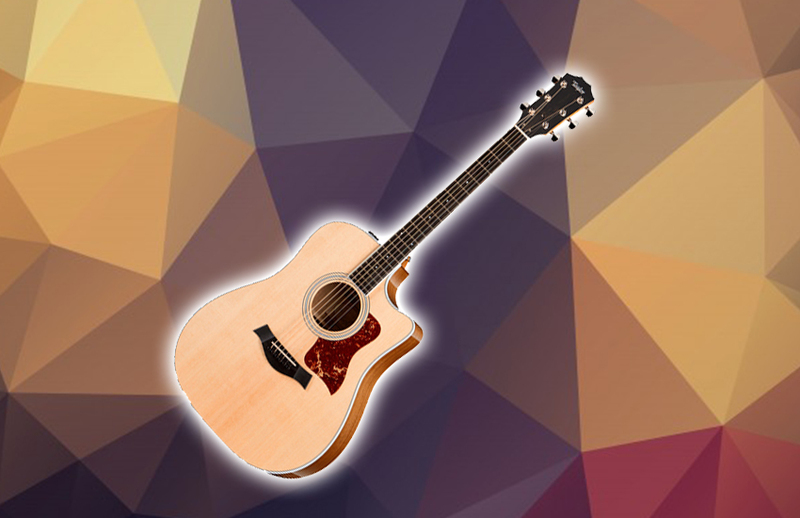 Intended for home, practice and concert use, this Dreadnought guitar can handle medium strumming and flatpicking. Reviews of the 410 Taylor show lots of player types finding a use for the career-long quality instrument, but bluegrass pickers seem to be particularly fond of it. The warm tone of the wood combined with the characteristic Taylor brightness makes for a combination that gets people’s attention every time. It’s priced higher than the 310, and you can thank the more expensive wood for that. The retail price is about $2,400, but you can find one new online for less than that with very little effort. 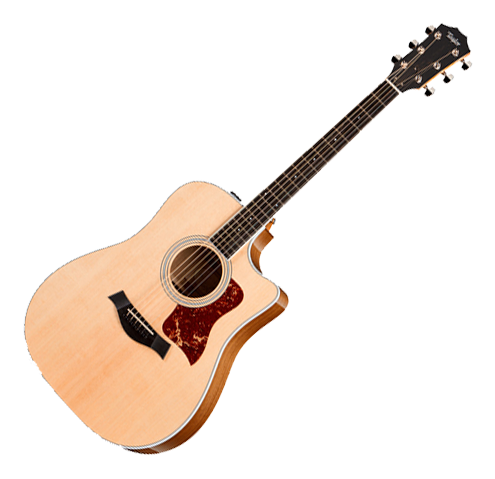 Reviewers who’ve played a 410 Taylor guitar don’t hesitate to recommend it. When beauty is more than skin deep and the sound is as rich as chocolate, you know you’re dealing with a quality instrument from a quality company. In this case, it’s a 410ce, and it’s from Taylor. This means that if you decide to get this guitar, you will be left with a very high-quality instrument that can be used to play any genres of music without a problem. In my opinion, it doesn’t cost too much considering what it has to offer, and that makes it one of the top guitars for beginners. If you want to play a similar guitar, but you don’t want Ovangkol, then you can get the 310CE version which is usually cheaper and can be found easier.